Guided walks & sightseeing in Cotswold and Shropshire Areas of Outstanding Natural Beauty. Visit Wayland's Smithy, Rococo Gardens, Cotswold Way, Sudeley Gardens, Kiftsgate Gardens, Goodrich Castle, Arthur's Stone, Long Mynd, Church Stretton, Kenilworth Castle and Cliveden Gardens. Stay in the historic villages Cirencester and Church Stretton. with stunning landscapes, and beckoning gardens and historic sites -- all along superb walking trails! The Cotswold area of England needs no introduction – a landscape of rolling hills and meandering streams with idyllic towns and villages famous for their honey colored stone and thatch-roofed cottages, medieval churches and manor houses, rich history, lush gardens, tea houses, hedgerows, and of course, the home of William Shakespeare. Truly a charming and historic part of England which is always a delight to visit. Equally intriguing, Shropshire County is considered a hidden gem in Britain - the hills of Shropshire are a walker’s paradise – a very special landscape rich in geology and wildlife, and ingrained with heritage. Off the beaten track and tranquil, this is a living, working place, loved by locals and visitors alike for its quality of environment. The villages where we are based are big enough to offer modern amenities, yet small enough to get a sense of the people and local culture that make these regions unique. A further bonus comes from our British partners with whom we enjoy a comradery and an insider’s edge on our explorations throughout England. The scenery, nature and historic sites along our Cotswold and Shropshire walks live up to their status as Areas of Outstanding Natural Beauty. If you have walked in these islands before, you are already aware of the stunning countryside and if you are visiting for the first time, you will see what all the fuss is about. Our exploration of the Cotswold region on foot takes us through meadows, rolling hills and woodlands, through villages and countryside brimming with history and nature – we visit iconic Cotswold towns with names like Snowshill, Bourton-on-the-Water, Stow-on-the-Wold and Chipping Campden where there are delights around every corner. All this from Cirencester, our base in the heart of the Cotswolds. We travel northward to the secret hills of Shrophire near the Welsh border to the Village of Church Stretton, tucked under the Longmynd moor with excellent walking facilities. The views over 360 degrees are unrivalled and at each turn on your walk, you will get a different and magnificent view taking in the Black Mountains, the Berwyns, Cader Idris, the Malverns, and the Staffordshire peak district. When not walking full days in Cotswold and Shropshire as we travel, we visit several world class gardens and stroll through the grounds of Neolithic, Roman, Saxon, Norman and Tudor sites that embrace the region's cultural and historic interests. We end our tour back in the London area at a magnificent garden along the River Thames. This location offers visitors the convenience for onward travel or for visiting London. Hospitality of the local people – always welcoming – complement this superb walking destination. Accommodations include 7 nights in 3/4 star rated hotels with private bathroom and all modern amenities. Meals include 7 breakfasts, 5 lunches and 7 evening meals. Entrance fees to gardens and sites as per the Itinerary. Full-time services of a Tour Leader and expert Walk Manager with the group from start to finish, ensuring personal attention and assistance. Itineraries with experiences and sights emphasizing the history, flora and fauna, culture, and scenery where we walk. Full program of guided walks daily between 3 and 10 miles -- rated easy to moderate. Our Guides are professional, experienced, passionate and knowledgeable. Small group tours ideal for solo travelers, couples and groups of friends. All in-country transportation between where the holiday tour begins and where it ends per the itinerary. This is a land only holiday so your flight or other transportation to and from the designated tour starting and ending locations are not included. Meals not specified as included (2 lunches). Beverages (including those taken with an included meal). Accommodations are in 3 and 4 star rated facilities, often with historical or architectural interest. All guests have single or double rooms with a private bathroom, television, hairdryer, telephone, and most also offer free Wi-Fi and tea/coffee making facilities. There is no single supplement for this tour. All breakfasts are part of the hotel stay and are usually full English breakfasts served buffet style. Lunches are typically in country pubs along the trail and offer regional specialties and a varied menu selection of tasty baguettes, baked potatoes, sandwiches, salads and delicious soups. Dinners at our hotels are usually 3 course affairs and include regional specialties with the finest and freshest local produce. Special dietary requirements are never a problem – so please let us know. We strive to ensure a relaxing and comfortable dining experience with excellent food. Stratton House Hotel in Cirencester. The Stratton House Hotel will be our base for 3 nights while we explore the Cotswold’s countryside. The hotel combines country house charm, traditional elegance and style with modern amenities and is conveniently located on the outskirts of Cirencester, the capital of the Cotswolds. Longmynd Hotel in Church Stretton. The Longmynd Hotel is situated in an Area of Outstanding Natural Beauty with a magnificent hill-top location offering panoramic views over the old market town of Church Stretton and the surrounding hills. The Longmynd offers modernized rooms, and fabulous food and service. Sir Christopher Wren Hotel in Windsor. Historic and full of character, the Sir Christopher Wren Hotel is located between the banks of the Thames River and Windsor Castle. The hotel features riverside dining and spa facilities in the heart of Windsor and is conveniently located on the outskirts of London. The walking program varies from easy to moderate with a few strenuous stretches. All walks are done at a steady and comfortable pace with stops to rest and take in the scenery. If you are moderately fit, you should not have any problems; our focus is on enjoying our surroundings and not on finishing in record time. Walking boots are necessary and many walkers find a walking pole useful especially on the downhills. You will also need wet weather gear - generally the climate is mild in the Spring, Summer and Autumn and you can usually count on a rain shower or two. We will furnish a list of recommended gear with our Holiday Information Sheet for our guests about 30 days before the holiday begins. Additional walk details are furnished below. Moderate grade: Distances of 7 to 11 miles a day, ascend and descend up to a maximum of 500 meters (1640 feet). Easy grade: Distances of 3 to 7 miles and include sightseeing in the villages, gardens and historic sites we visit that are on the itinerary. There may be some hills to ascend but most are of the rolling kind and we never rush - more of a stroll. Terrain: Conditions vary and encompass gentle rolling grass covered green pathways, established hard packed earth paths through fields and rocky outcrops, woodlands with dirt paths, and loose stones in areas. 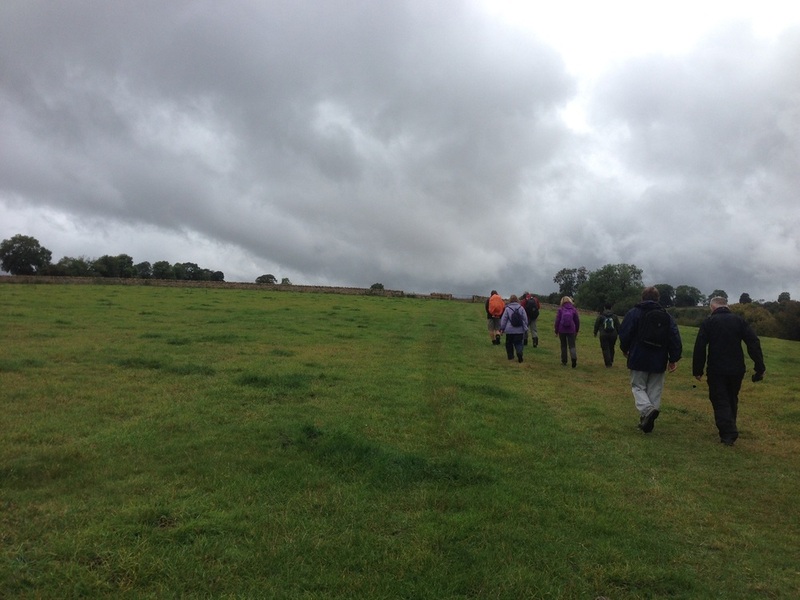 Cotswold's Area Walks. We spend two and a half days walking in the lovely gentle rolling hills of the Cotswold countryside from our base in Cirencester. We cover between 8 and 10 miles per day with few major climbs. There are hills to ascend up to a maximum of 200 meters (650 feet) over two miles of walking, but the climbing is gradual and we do not rush. Full day walks begin from our hotel following breakfast at 9:30 and end mid-afternoon. Cotswold is ideal walking country with well-signed footpaths of varying distance – perfect strolling paths that crisscross the lovely countryside, ending in a quaint and picturesque village. Bourton-on-the-Water. We travel through the outskirts of this pretty Cotswold village, continuing on to Lower and Upper Slaughter in the Windrush Valley. Over higher pastures enclosed by stone walls until we drop down into Naunton for lunch. After lunch we continue walking through this charming countryside following the valley into Bourton-on-the-Water for tea. Heart of the Area of Natural Beauty. We walk from the hotel and pass through villages nestling in unspoilt English scenery, traveling over rolling hills and through meadows to Chedworth and the heart of the Area of Natural Beauty where we have a pub lunch. After lunch we walk along River Churn and back into Cirencester for a cup of tea. Shropshire Area Walks. We spend two days in this walkers’ paradise with good paths and an ever changing landscape. We cover 8 to 10 miles per day. The hills we ascend are up to a maximum of 500 meters (1640 feet) over two miles of walking and there is no rush. Descending is gentle and not precarious. Full day walks begin from our hotel following breakfast at 9:30 and end mid-afternoon. Shropshire's secret hills offer the walker fascinating geological interest and the views of the entire area are simply stunning. The Long Mynd. A superb walk through Carding Mill Valley, ascending to the top of the Long Mynd at Pole Bank. Walking along the heather-clad ridge before descending down one of the many delightful valleys for our lunch stop at a local hostelry. In the afternoon, we ascend Ragleth Hill and walk along its ridgeline with views in all directions, before returning to Church Stretton in time for a cuppa. The Stiperstones Ridge. We travel out over the Long Mynd to reach the rocky tors of the Stiperstones ridge. This is a magnificent drive in Shropshire’s best hill country. Our walk takes us under the legendary Devil’s Chair before descending to the old lead mining village of Snailbeach. Lunch is at the quaint Stiperstones Inn. In the afternoon, we pass several old lead mines as we view the Stiperstones Ridge from a distance ending up at The Bog Visitor Centre for a cuppa and cake. Transport back to Church Stretton. Clun's Castles and Hill Forts. We travel to Clun and walk over Steppleknoll to Bury Ditches Hill fort - a superb Iron Age fort - and then through fort and glade back to Clun along the Cefns ridge. Little steep climbing, many pastoral scenes, good paths - a superb walk. From the Bog to the Church. 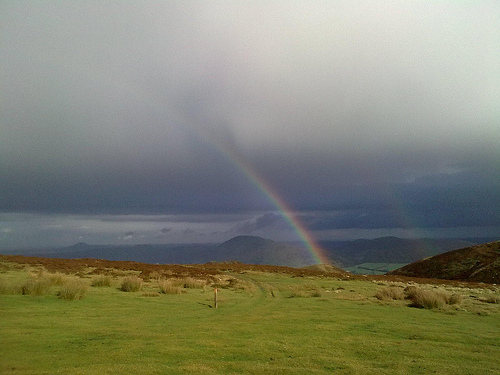 We travel to the Bog Centre on the Stiperstones, and walk back to Church Stretton. Under the Devils Chair, over Gatten and Ratlinghope Hills, before lunch at Bridges. We ascend the Long Mynd moor via the Darnford Valley, and Wildmoor, before arriving at Cardingmill Valley, then back into Church Stretton for tea. Wayland's Smithy. 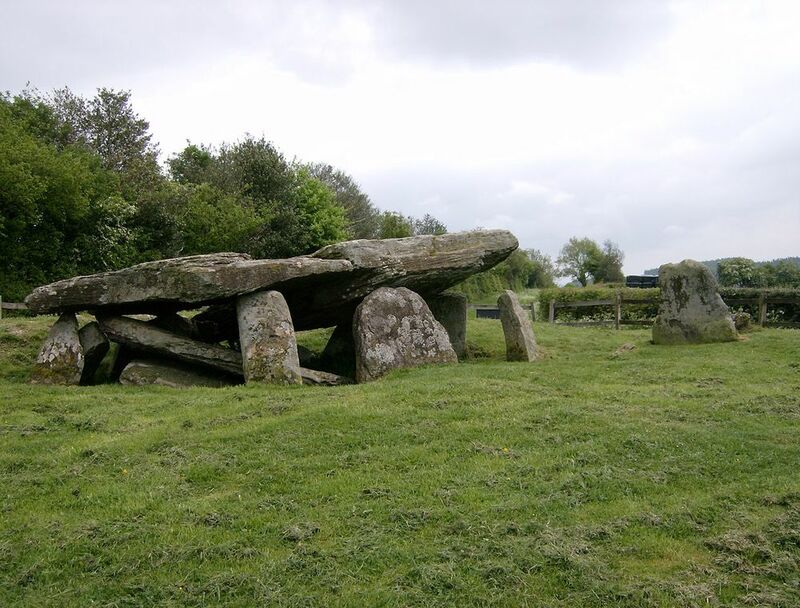 Considered one of the most impressive and atmospheric Neolithic burial chambers in Britain. Its name comes from the belief that it was once inhabited by the Saxon Metalworking God Wayland. Excavations uncovered a structure holding remains dating back to 3550BC and under that structure was an older barrow from 3400BC. The walk to see the barrow is along the Ridgeway near the White Horse chalk – a good warm up walk of about a mile. Rococo Gardens. Unique gardens are a replica from the 1750s when gardens were created with fancy and frivolity in mind – a garden for parties of the time. The garden was replicated from a 1748 painting and the plants are all what existed before 1745 in contrast to most of today’s gardens. There are plants from the Americas brought back in the 1700s. Sudeley Castle & Gardens. The Castle is surrounded by landscaped gardens, yew hedges, wildflower and nature walks, the Queen’s garden, a medicinal herb garden and over 100 varieties of roses. St Mary’s Church on the grounds, restored in 1855 is where Queen Katherine Parr is entombed. She is the last of Henry VIII’s wives and actually outlived him and she is also the first English Queen to publish a book under her own name. Kiftsgate Court Gardens or Hidcote Gardens. Kiftsgate Gardens, created by three generations of women gardeners, are positioned on the edge of the Cotswold escarpment resulting in a lovely setting with excellent views of the countryside. Gardens on the grounds include a wide variety of trees, shrubs and perennials designed with a focus on their natural settings – the Terrace, Wide Border, Sunken, Rose, Water to name a few. Hidcote is a popular garden for large tours and hence, is more crowded, busy and noisy but does offer wonderful gardens with seasonal interest. Hidcote is considered one of the most influential 20th century gardens in Britain with gardens laid out in a series of outdoor rooms – herbaceous borders, secret gardens, topiary, winding pathways and exotics. Hailes Abbey. A 13th Century Cistercian Abbey founded by Richard, Earl of Cornwall and brother of Henry III. There was a legend about the blood of Christ being in a phial within the Abbey’s east end and it became a popular religious pilgrimage destination for a few hundred years. The Abbey was destroyed in 1539 and is a lovely medieval site to explore by foot. Goodrich Castle. An English Heritage property and off the River Wye, this 11th Century Castle is considered the most complete set of medieval domestic buildings surviving in any English Castle. The grounds and ruins are a great way to explore the intriguing history in a commanding setting by foot. Longtown Castle: Well preserved ruined fortress with a round keep, unusual for the English and much more common in nearby Wales. The ruins and grounds can be explored where you see the remains of a 7 seat latrine and you can climb the battlements. Its location in the Olchon valley gives you views of the Black Mountains. Arthur's Stone: Neolithic burial chamber over 5000 years old made of large stone slabs in the hills above Herefordshire’s Golden Valley. Part of many prehistoric ruins in this area and has been linked to King Arthur who according to legend, slayed a giant who left the impression of his elbows on one of the stones as he fell. There are other legends that it is Arthur’s imprint in the stone but in any case, it is a nice location to exercise our walking muscles while taking in the scenery and history. Wenlock Priory. Picturesque ruins of an Anglo Saxon monastery founded in 680. The Normans then took it over and made it into a priory and parts of the 13th Century church remains. Interesting features also include an unusual washing fountain, the elaborate decorations of the 1140 Chapter House and a topiary filled cloister garden. Kenilworth Castle. One of England’s most impressive set of castle ruins where we walk in the footsteps of royalty. Once home to Robert Dudley, the great love of Elizabeth I. We can explore the tower and the Queen’s private staircase and the Elizabethan Garden which was recreated after being lost for 400 years. Milton's Cottage. Once home to the English Poet John Milton where he finished Paradise Lost. He lived there the last 10 years of his life while hiding out from the plague. It is now a museum containing a collection of first editions of his works and there is a Grade II listed Historic garden around the cottage. Cliveden Gardens. The Overlooking the River Thames, the impressive all season Cliveden Gardens is a National Trust property located in Buckinghamshire on the outskirts of London. The Gardens were once part of an Estate in which the house that once hosted dukes, earls and royalty is now a luxury hotel. The gardens and grounds are expansive and the highlights include a Parterre with expansive views, The Water Garden, The Long Garden with seasonal flowers and of Italian influence, The Rose Garden which is blooming from mid-June through September, the Woodlands, and The Cliveden Maze. The British are very fond of mazes and take pride in trying their best to get you lost. There is also a luring walkway down to the river as well as several café’s and tearooms for lunch or a cuppa. Cotswolds. The Cotswolds is great walking country with over 3000 miles of footpaths and rights of way, including the National Trail's Cotswold Way and Thames Path and most towns and villages have a choice of shorter circular routes. Cirencester, known at the "Capital of the Cotswolds," is an historic Roman town in the heart of the Cotswolds, making a perfect base from which to discover this iconic English landscape. Church Stretton. Church Stretton, our base in Shropshire, is an historic Market Town situated in the heart of the South Shropshire hills on the English/Welsh border known as The Marches. At the heart of the Shropshire Hills Area of Outstanding Natural Beauty, it is renowned worldwide for its geology, with some of the oldest rock formations in existence. There are market towns and villages, castles, hill forts and more in close proximity. This unspoiled area of England offers beautiful countryside, with superb walks right on our doorstep. London Area. Should you be interested in adding days and nights to either the beginning or end of your time with Great Circle Route, we will be more than happy to assist you in deciding where you might like to go and help with the arrangements if needed. The list of activities in the London area is endless. There is good public transport that can get you anywhere you want to explore and London is also a fun city to walk. Some of our favorite places to visit include Westminster Abbey, The Churchill War Rooms, the British Museum which has wonderful Greek and Roman Britain artifacts and of course the Rosetta Stone (I rarely make it off the ground floor), the National Gallery and National Portrait Gallery, the British Library, the Victoria & Albert Museum, Tower of London, National Maritime Museum and the Royal Observatory in Greenwich to see the prime meridian, and all the parks – Green, Hyde, Regents and my favorite, Kensington Park (I always locate the Peter Pan statue as my guide). Getting to the Holiday. The price for this holiday is land only and does not include flights from the United States to the United Kingdom. We can help research your options for arranging travel to the United Kingdom or coordinate with a booking agent. Please note that the published holiday dates are the dates you arrive in your holiday area and not when you leave the United States. Extra days or nights. If you are interested in adding any extra days and nights to your holiday, and you would like our help, please let us know. Passport and Visa Requirements for U.S. Citizens. Passports must be valid for at least three (3) months beyond the period of intended stay and issued within the past ten (10) years. It is further recommended that your passport have at least six (6) months validity remaining beyond the date of completion of the holiday and ensure there are a sufficient number of blank pages in your passport (usually 4 to 6). No Visa is required for stays up to 90 days. Consult the U.S. Department of State’s website for the most current country requirements. NOTE: Currently some locations in the United States are using Automated Passport Control systems for re-entry into the United States which precludes stamping of passports. Weather. The weather in all of England can be quite changeable with sunshine one hour and overcast or a brief shower the next. It is for this reason that the dynamics of the changing skies add to the beauty of the scenery. It is important to note though that the weather is always manageable. The temperatures in the areas we travel are generally mild in the Spring, Summer and early Autumn, with a light jacket or sweater for the evenings. Some walk itineraries might change due to path conditions or weather. Single Supplement. For single travelers, there may be a nominal supplement if we are charged a supplement. Typically, holidays in the United Kingdom do not require a single supplement - this will be noted in the itinerary and description of the holiday. In the event there is a supplement, we will notify you of this in our quote to you and prior to your booking.